If you filed a case against your tenant and won it in court, things are far from over. Collecting judgment can often be a very frustrating and difficult experience. If you won the case and the tenant owes you money, you will now become a judgment creditor and the tenant will be a judgment debtor. 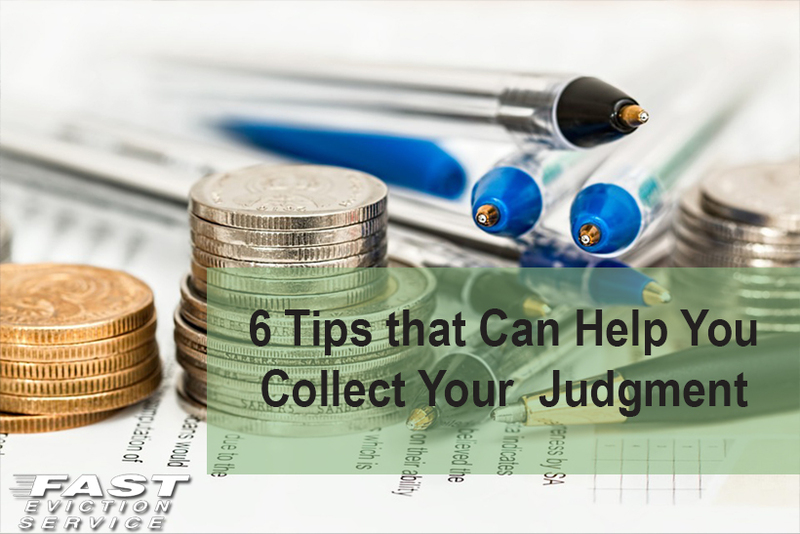 Let us have a look at 6 tips which can be of great use if you want to collect the judgment. Remember that the debtor in California is very well-protected from any unfair or abusive methods of debt collection. It is no recommended that you use any deceitful or unfair ways to get your money. Avoid suggesting the debtor that he/she will have to let go the property unless the court has agreed on the eviction verdict or they will face any kind of criminal charges when they have not committed any crime. If the judgment creditor is too aggressive, the debtor can also file bankruptcy. And once bankruptcy is filed, the creditor will then be required to again file their claim in the bankruptcy court. Thus, it is highly recommended that both the parties should try and work on a mutual decision. Ensure that you keep the records of any and everything that you do for collecting the judgment. Have the contact information of the debtor and create a list of their assets. It the debtor has already provided you with an SC-133 Form (Asset Statement), you should start finding assets listed on the form. Track all the money you spend on collecting judgment as in many cases you can be reimbursed for collection expenses. Also, keep a record of interest on the judgment. Make sure that you record the date on which the entry of the judgment was made in the court for calculating the interest. If the debtor makes partial payments, keep a track of that as well. If partial payment is done through a check, note the location of bank branch as well as account number. Creditors can also get in touch with a collection agency or a lawyer to help collect the judgment. However, you’ll be required to pay about 15%-20% of the judgment amount to them. They generally write notices to debtor and can help you locate the assets of the debtor. The judgments are generally only valid for a maximum of 10 years. A creditor can then renew the same for 10 years again. Make sure that you renew the judgment before the expiration date. Rather than taking matters into your own hands, especially when you don’t know much about the process, you should get professional help for the collection process. Professional advisors will help you understand the whole process and can recommend effective ways for collecting the judgment.